QuickStreamer is an extension for Google Chrome that allows you to run livestreamer from your browser, without having to use the terminal. Since QuickStreamer use Google Chrome’s Native Messaging API, you need to install both extension and a native messaging host, or it won’t work. The host app is writtent in Python so you can easily view the source code. Please make sure livestreamer work before following these steps. To update the host app, just do all these steps again. It’s pretty simple. Go to any live channel on supported sites ( Twitch, Hitbox, … ), then click on the QuickStreamer icon on the right side of the address bar. 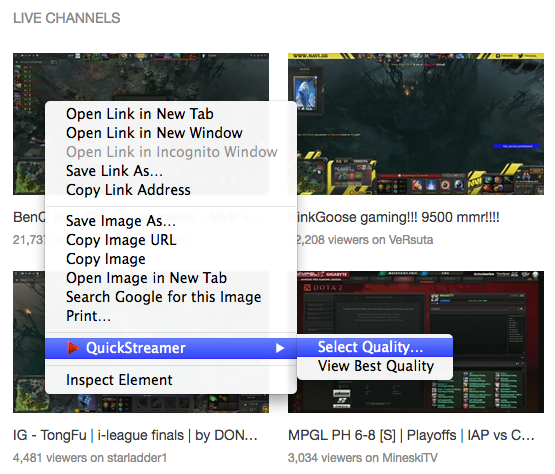 Select the quality you want and click “Open livestreamer”. Wait for a few seconds and the VLC Player will be opened. Allow other extensions to open livestreamer using QuickStreamer. Soon you’ll be able to do this in Twitch Now. Reverse the quality list. Now it sorts from best to worst. New host app version. Mac users don’t have to open Chrome in Terminal anymore. Yay! Rewrite many lines of code. Now it’s easier to add more sites. Add “Open chat popup” for Twitch. Add QuickStreamer into context menu.